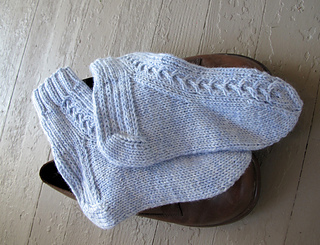 These cozy socks are made from the top down on 48, 54 or 60 sts. So they’re quick to knit but the simple cable and ribbing pattern gives them a nice stretchy fit and keeps the knitting from being boring. The toe is done in a traditional, simple technique from Lithuania that does not require Kitchener stitch. This pattern also includes a recipe. In the summer of 2008, during our whirlwind tour of Lithuania, Zigmas Kalesinskas, director of the Vilkija liaudes amatu mokykla (Vilkija Folk Art School), invited us to stay at his home. When people graciously invite you into their homes for a meal, you eat what they serve. And so I found myself face to face with a big bowl of Pepto-Bismol colored soup. Saltibarščiai—cold beet soup, or borscht, pronounced shaltee-barshay—is a favorite summer dish in Lithuania. I’d been afraid to order it in restaurants because of the color. But now, I took a deep breath, scooped up a spoonful, and tasted it. What a surprise! It was delicious! Perhaps I should have known I would like it, as I’d grown up eating so many other Lithuanian foods that my grandmother made. After we left Vilkija to continue on our journey around the country, I ordered šaltibarščiai for lunch at every restaurant that served it for the rest of the summer. And when I went home, I learned how to make it myself. 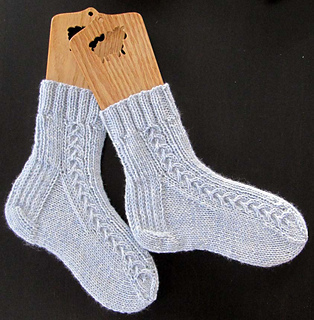 I didn’t see very many projects made with cables in Lithuania, just a few pairs of gloves in museum collections and these socks. I’ve included them here because they were made by Zigmas’s aunt. Perhaps I should have made them in hot-pink yarn.